Minor bug fixed: on the devices which have their Home button not on the physical device but overlaid on screen were returning the wrong screen width as it was subtracting that area which the app overlaps anyway. This resulted in the clicking on the screen not to be perfectly aligned to the 3D world behind it. (The game is rendered through a view-port into 3D perspective – the touch events are Cartesian coordinates which have to be cast into that 3D world to identify the selection of card[s]. I also applied fixes to bugs send in by users by the reporting mechanism. I have resolved all that I can – some have been raised by players with custom ROMs and have disabled required features (like the Gallery / Photo – then try to chose a custom image!). And others are Android Not Responding which are caused by the Operating System but fire in my app so it looks like Solitaire crashed (these are the hardest to diagnose, 100’s of lines of data and code traces and stacks, and not one of them originating from my code!!). Also, the option between 1 full screen or banner ad has been opened to all languages now the translation work for that setting has been finished. Also, also, the cause of that *new* permission: Read Phone State: has been identified and removed. An unneeded java class was being called in by a class I was using, so I managed to use the code I need and filter that sub-class out (and Java has no conditional compiler directives, making this rather a task). Still migrating to Nougat, removing depreciated code and putting in conditional checks of the newer SDK features. Also, all supporting libraries have been updated. As I cannot test all what has gone in (emulated devices barely scratch the surface of testing), I’m a bit anxious about unexpected crashes – but best I deal with them now than put it off! Major bug in how I was calculating the Frames Per Second, thus CPU usage. A while back I switched from using a millisecond counter to a nanosecond counter for better accuracy and smoothness. Only, I forgot to divide that difference by 1 million (nano -> milli) thus the renderer thought it was taking about 3 seconds to calculate the screen (as opposed to the 3ms it was really taking), so it never put the thread to sleep to make up for the spare time to cap my FPS to 40 – so it was running full tilt. I put in a couple more CPU saving routines too, after 2 seconds of not playing the game the FPS drops to 10 which cuts down on CPU usage. During this time I also skip the code which builds the image – so it’s more like that it takes a screenshot of the last known postion and shows that instead of math and rendering, and switches back to render mode when the user starts playing again. I finely tweaked the playing speeds so it just plays a little bit faster, which is better on the newer devices (as opposed to the devices it was being played on 5 years ago!). Ironically, animating faster uses less CPU as it gets to the sleep state quicker and has less steps (animation frames per card) to calculate. Full screen ads culled, now only show when starting a new game and only after an interval of 3 minutes since the last ad – so at least 3 minutes apart, and only when a new game is started. There were full screen ads in other places, but since I applied the request of a player to put a full screen ad in on the new game I neglected to remove those other ones (like on the Pause) – so now full screen is *only* on new game, nowhere else. The Long Press of the Android Back was also opening the menu as it did the Full Undo – fixed. Removed the screen flash when returning from another screen. The timer is now Kept running even if not showing, and subsequently doesn’t restart the game if the timer option is changed. Almost fixed bug which at times doesn’t always do the smart move when clicked – it misses far fewer times now, but it still doesn’t always fire (I think it may be due to the game still rendering animations). Lost sound. All other sounds ok. Sorry for the delay in my reply, I was out of Internet range for a couple of days! As I’m not sure as to which aspect of sound you’re referring to I’ll cover all of them. Ensure that the Sound switch is on (unlike mine! ), the Volume bar has a value, and that the individual sound effects you want are also selected. Also, check the Media sound volume in your sound panel – if the media volume is zero it won’t matter what settings are in the app as media will override them. If I haven’t answered your issue properly please let me know and I will try to resolve it. I have just paid for Pro game and I can’t get game to down load any new card backs or anything! If this can’t be fixed please send refund! All the decks which you have downloaded should still be there. They are stored in same location on disk, both for Free & Pro. They are Butterflies, Flowers, Precious & Space. If they won’t load even after selecting them perhaps you could try Uninstall and Download again. Please get back to me if that still doesn’t do it! Been playing this game for about 2 Years now and have never had ads Pop up every 2 seconds just started 2 days ago what’s up with that? Oh, you know what? I had the exact same thing about a week ago. Now my battery was down to like under 15 percent, which I never allow it to get that low, and I suspected it was some battery saving device – like maybe scaling images or controls on the fly in an attempt to cut down CPU load. I’m running the latest Nougat on my Galaxy S7 so who know what cleverness they are trying to attempt. One thing I can state for sure is that I lock the ads to that little banner on the screen – I mean, I have a panel there which is locked in place and set size – so if a “clever” ad tried to extend an invisible border so it got clicked it would still be confined to my panel (specifically its a relative layout view). I can also state I haven’t updated the app in a couple of months, so whatever is doing it is must be coming from another update (like the operating system). Obviously it had me worried, but when I recharged my phone it stopped (well, it only did it twice, but that’s enough to concern). So go figure! That’s a good idea. 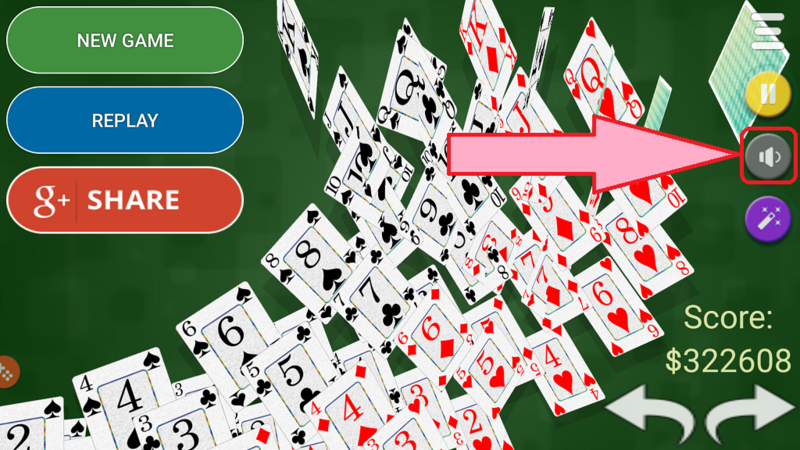 I have no idea what I could set as goals – maybe I could take a peak at other solitaire games! Nothing immediately obvious on the surface, but many changes to keep up with Google’s development cycle. Fully compatible with the latest version, as well as fixing every reported error. Solitaire 3D was also fully tested by a specialist company and their findings have been incorporated this release. Significantly I have reduced the number of full screen ads to 1 every 5 minutes, minimum. Which means after playing for half an hour you’d be lucky to see more that 5 seconds of ads – try getting that from watching TV! If this hits the income stream too hard I many need to revise this! Although not documented in the Play Store, if the user chooses to have the banner ads instead, and one is clicked, the banner bar will hide for several minutes. I cannot endorse this activity on the play store listing as there is to be no compensation for clicking ads. 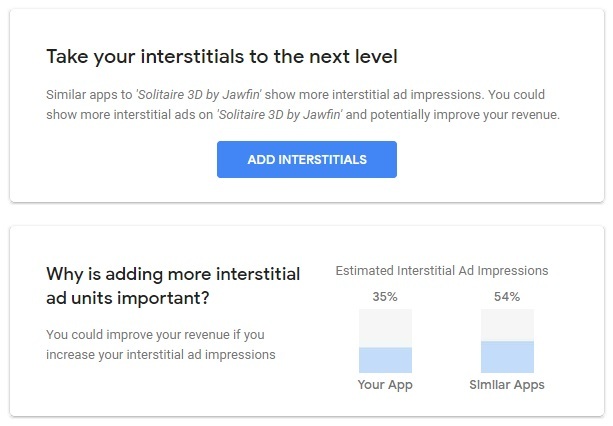 To my mind not showing an ad is hardly a compensation – also I am worried someone may click it by accident (should not happen though) and this will at least prevent that from happening consecutively. 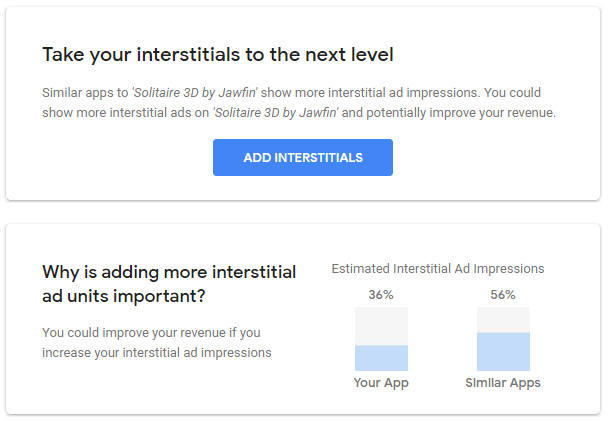 I can state I have spoken directly to Google and AdMob about this and they agree I am not breaking the rules – but I cannot promote this as a feature. No Loss! Let’s see – I removed the g+1 button as it no longer seems to support Android Play Store addresses – although there’s not a peep from Google about that – I guess they are quietly trying to undo the attempted dominance (and subsequent backlash) of social media. I have installed all the latest run-time libraries and replaced old legacy [deprecated] code with the modern equivalent (where possible). Applied a lot of code optimisations revealed by Lint. There was a bug (or more precisely an unnecessary semaphore lock) which meant at rare times a screen touch was being ignored – that signal/wait has now been removed. I also found a means to cut back on CPU usage when the game is idle, that is, on-screen but not being played. This kicks in after 2 seconds of not touching the screen. Note, this can [very rarely] cause the screen to flicker when coming back from a sub-activity (like Pause or the Options screen) – but it is temporary and worth the processor saving. Sorry I don’t understand the point being made. All the decks, the built in ones and the extra downloadable ones all have 52 cards – or else the game could not be solved. Please let me know by what you mean “not full decks”. Thanks, Jonathan. Minor bug fixes, mostly from the built-in error handler but at times from players’ feedback. I also (hopefully) reduced the chance of an “Android Not Responding” (ANR – at application level, not device level [i.e. game freezes but Notifications and Home button still work]) due to the handling of the OpenGL 3D surface, specifically in reference to leaving the game (in which case it’s ANR isn’t even noticed anyway!) and screen orientation changes. Oh, really? Wow! I thought it was behaving properly. The thinking is it’ll suggest the move most likely to help solve the game. What you’ll see though, for instance. is it will never suggest moving a card which has no face-down cards above it unless there is a King ready to go into that column. The reason being is say, you move a red 8 onto a black 9 which frees up a column which a King could play on, it won’t suggest that unless there’s a King in waiting. Because, you may come across the other red 8 which moving it would be more advantageous. This is because potentially a King could go on any free column, whereas that other red 8 has only that 1 place (except for the base itself). Thanks very much for writing, it’s great to hear from you! The Pause button and screen has been removed. Google’s policy is that any game which offers a Pause option in-game must activate that pause when the Android back button is pressed. That behaviour is expected, well, required, of this application. And as we use the back button to go back a move I decided to take the Pause out. After all, it was only there to stop the timer for timed games – which is equally achieved by going into any other screen! There is colour back in the Sort button. Some Android version changes removed it (something to do with spannable unicode characters treated as emojis [I knew you would be interested in that]) – but still they do show as black only on some devices. I’m talking about this button!! As usual, bugs and errors reported by the automated error capture routines have been fixed as far as possible. Last versioon not stabil, restart after the few second working. Huawei P10 Lite. I didn’t change anything in the engine of the game – but I always update to the latest APIs which plug into the app. When you say “restart” do you mean the game undoes all your moves back to the start, or it starts a new game, or the app itself crashes and you need to re-run it? Is it doing this repeatedly, or just once or twice? To address those crash issues. I changed ad providers as it was that which was crashing my application. Not impressed. Anyway, now resolved!! So if you don’t see your post or my reply that would be why. Updated to all the latest Android SDK libraries. Changed crash handler, as recommended by Google. 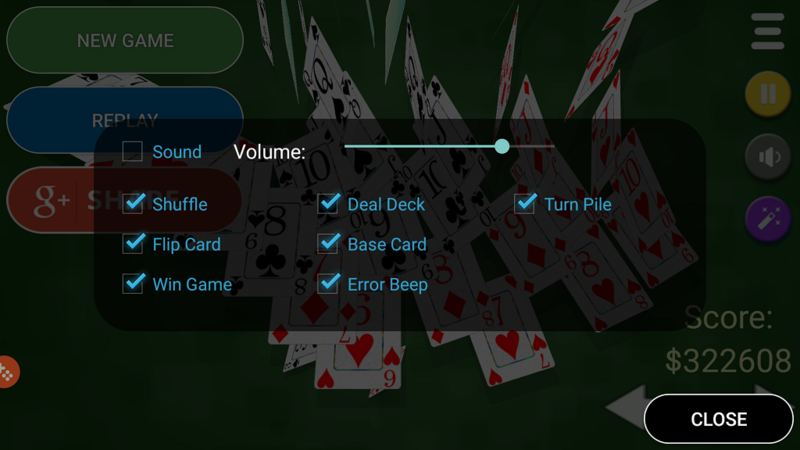 I noticed that Solitaire 3D randomly assigns games that were lost. I won all games, but Scores show that I want only 88%. What’s up? Google are releasing a new security protocol which compares the installed apps signature to the known generated ones. I had implemented a similar system years ago, but as theirs will re-sign the app mine will falsely fire, so this install now disables that layer of security. Another Google requirement is the app is compiled to a minimum SDK level so I am ensuring I have the latest version. 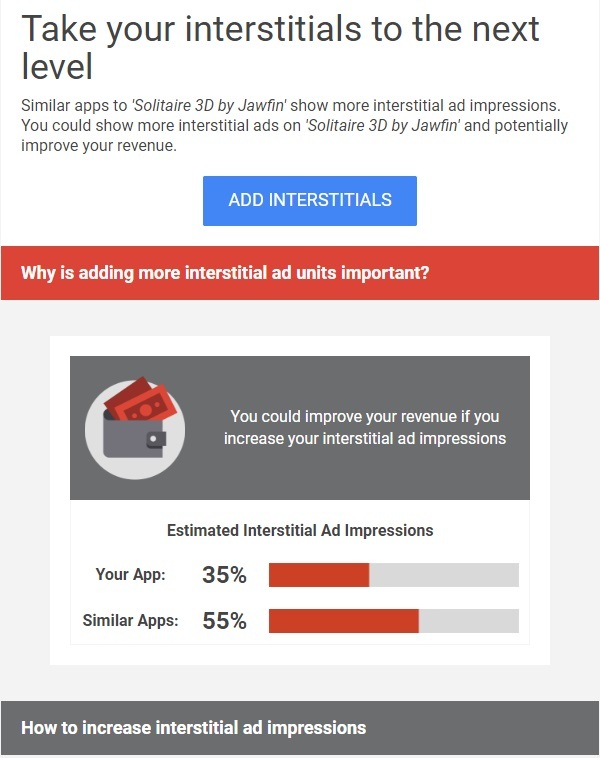 Both these ideas by Google are good, if not a little late in their implementation! I caught a big bug too – well, not a bug in my code per se, but Google changed its policy on the handling of certain activities. In that, if a window is created full-screen, transparent, with a requested orientation (landscape = side-on), then this was not allowed. Not allowed to the extent it would crash the app. The thinking being a transparent screen should not request orientation as it must inherit from the screen behind. I was using transparent screens for the on-screen controls and individual sound effects – so now those screens have a solid background – no great loss but extremely hard to track down in the code what was causing the critical crash! bringt ein Packerl usw. da habe ich immer wegen der Zeit die Pausetaste gedrückt. Mir fehlt die “SEHR”. 3.,Kann mann die G+Share von der Spieler Seite nicht entfernen, dieße stört mich unheimlich braucht keiner. brings a pack, etc. because I have always pressed because of time, the pause button. I miss the “VERY”. 3., Can not remove the G + Share from the player page, that does not bother me, no one needs. Ok, so, the Pause had to be removed as due to Google policy. If there is a Pause button on the screen then pressing the Back button must activate it. We want the Back button to undo the last move, but Google will not allow that. I had a few arguments with them about that, but I had to remove the Pause as I wanted the Back button to behave as Undo. Note that opening another screen or closing the app will pause the timer. Again with the Google Share button: even if you turn off the Google Play Services in the Options the Share button, the Goals and Leaderboard buttons must still show. I had another argument with Google about that too! But they say if my app offers it, it must show even if the user logs out of Google Play Services. They will not feature the app unless these conditions are met. Ok, also musste die Pause aufgrund der Google-Richtlinien entfernt werden. Wenn auf dem Bildschirm eine Pause-Schaltfläche vorhanden ist, muss diese durch Drücken der Zurück-Taste aktiviert werden. Wir möchten mit der Zurück-Taste den letzten Zug rückgängig machen, Google lässt dies jedoch nicht zu. Ich hatte ein paar Argumente mit ihnen, aber ich musste die Pause entfernen, weil ich wollte, dass sich die Zurück-Schaltfläche wie Rückgängig verhält. Beachten Sie, dass das Öffnen eines anderen Bildschirms oder das Schließen der App den Timer pausiert. Auch hier mit der Schaltfläche “Google Share”: Auch wenn Sie die Google Play-Dienste in der Schaltfläche “Optionen” deaktivieren, müssen die Schaltflächen “Ziele” und “Bestenliste” weiterhin angezeigt werden. Ich habe darüber auch noch mit Google gestritten! Aber sie sagen, wenn meine App es anbietet, muss es auch angezeigt werden, wenn sich der Nutzer von Google Play Services abmeldet. Sie werden die App nur dann unterstützen, wenn diese Bedingungen erfüllt sind. Werbung Googl+Share der Google geht mir so am “Arsch” mit der Werbung und seinen Auflagen. Google Googl + Share Google is so “messed up” with the advertising and its editions. I have to say though, it’s their shop, and they decide what product to sell. Google can decide on the quality of the product and any other requirements. It’s no different for Samsung and Amazon – they will not let you post an app which even hints of Google, even though it’s on Google’s platform! I don’t mind, I just make the product as best as I can for the user, in a way which Google approves. Ich muss jedoch sagen, es ist ihr Geschäft, und sie entscheiden, welches Produkt zu verkaufen ist. Google kann über die Qualität des Produkts und andere Anforderungen entscheiden. Bei Samsung und Amazon ist das nicht anders – Sie werden keine App veröffentlichen, die sogar Hinweise von Google enthält, obwohl es auf der Google-Plattform ist! Es macht mir nichts aus, ich mache das Produkt so gut ich kann für den Benutzer, in einer Weise, die Google genehmigt. Absolutely. Please email me your current score, games played and won, and whether you play 1 or 3 card dealing, and I’ll send back the instructions to transfer your score. 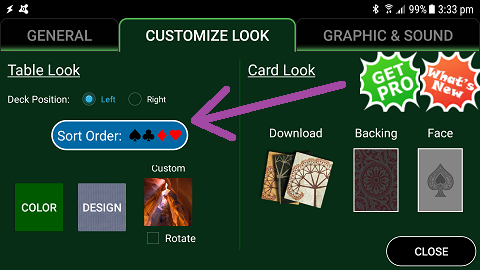 Hello Jonathan.my name is jillene aliceajillie.i just installed the solitaire 3d pro.im having issues with the getting into the menu with options.everytime I try to select anything in the menu box a popup window opens then shuts everytime.even after I uninstall and reinstall.i upgraded from the free to paid version because your app has become my favorite now. I don’t suppose you can see what the popup says? Does it have any words or images? If it is too quick to see, and you have the time, you can try this – use another device to video record the popup on your screen and watch that video using pause to see what it is showing. If possible then could you please send me a screen-shot of that behaviour? There is nothing in the application I can think of which would cause it to do this, especially as we know the Free version runs without issue. Please let me know how you go with that. No major changes, just keeping up-to-date with the latest Google SDKs and programming policies. Also, any relevant errors reported by their error-checker have resolved in my code. I say relevant, because, there is an obscene amount of errors generated by the Google libraries which can crash or cause my app to not respond, of which I can do nothing about…! Mostly forced update keeping up with Google libraries, which makes sense as newer Android hardware and Operating Systems are being released. GooglePlus has been removed. Google has decided to retire its GooglePlus social media – I was using this to allow you to post your victories on the Google+ wall. But Google+ never really did take off (you may notice Google silently removed the G+ feature from websites and apps about a year ago), so this was inevitable. Some bug fixes too, usually raised by exotic devices, and others which have been modified (read compromised) by the Telecommunication Companies who release them – so I do my best to handle the errors they raise which impact my app!